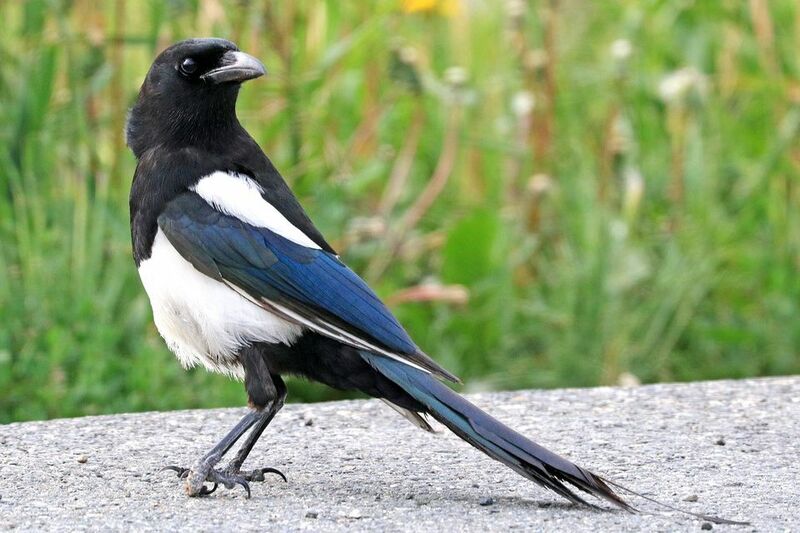 Formerly lumped with the common magpie of Europe and Asia, the black-billed magpie is an elegant and graceful corvid. Familiar and widespread in western North America, this bird is easily recognized by its size and gleaming coloration, as well as its distinctive tail. The black-billed magpie does have a black bill, but there is much more to these birds. Recognizing its field marks is essential to keep from confusing magpies with other large, dark birds such as ravens, crows, and grackles. Markings: Genders are similar though males may have longer central tail feathers. The head is covered with a rich black hood and black throat and breast. The shoulders are bright white, as is the abdomen. The back is blue-black and the wings and tail are black but show blue, green, or blue-green iridescence in bright sunlight. The undertail coverts are black. The eyes are black, and the legs and feet are also black. Some southern populations show gray-black skin on the face, but it can be difficult to see except at close range. In flight, the wings show a broad white patch on the primary feathers and adjacent secondary feathers, though the feathers are edged with black. Juveniles are similar to adults but show less overall iridescence and may show a brown wash on the white belly and scapulars. Pale red-gray skin may also show on the face, especially at the base of the bill. These are omnivorous birds and include many different foods in their diet, including insects, carrion, nuts, fruit, grain, eggs, and small mammals. They will dive on prey, pluck fruits from trees, glean insects from foliage, dig nuts out of leaf litter, and use many other tactics to find their next meal. While foraging, they have a strut-like walk with occasional hops on the ground, and they will hide food for future use. These corvids will also steal from other birds' caches and even human campsites, and they will perch on the backs of cows and other herd grazers to pick at ticks or insects. These corvids prefer open fields and agricultural areas with scattered brush and trees, and they will also frequent riparian corridors in arid regions. In the proper range, black-billed magpies are also regularly found in suburban areas if food is available. These birds are year-round residents of their range, extending as far north as southwestern Alaska, through western mountain ranges in Canada and the United States as far east as Manitoba and the western half of Nebraska and Kansas. Their typical range extends south to northern New Mexico and throughout Utah and Nevada, and west to eastern Washington and Oregon, plus the northeastern corner of California. Some birds migrate slightly in winter, typically to lower elevations, and a very slight movement further east is also common. Vagrant sightings are regularly recorded much further east, particularly in fall and winter, and occasional black-billed magpies are noted on the Pacific Coast of California. These are loud, noisy birds that use a rapid, harsh "keg-keg-keg-keg" call repeating for a dozen syllables or more. Other vocalizations include variations on the typical call as well as more drawn out notes, whistles, and begging calls. These magpies are gregarious and are regularly seen in family flocks of 5-15 birds, though in winter several families may join together to form flocks of up to 50-60 birds. These birds often perch on tall vantage points to survey their territory, and groups of magpies will mob raptors or other intruders in their vicinity. These are monogamous birds that typically mate for life, though there are cases of divorce between magpies if a better mate is found or a pair cannot produce viable eggs. Courtship behaviors include tail fanning and mutual feeding, and a mated pair works together to build a dome-shaped nest 2-4 feet tall with a side entrance. The outer part of the nest is constructed of sticks, mud, and thorns, and the interior is lined with finer materials, including weed stems and animal fur. The nest is usually positioned 20-25 feet above the ground, and the same nest may be reused in successive years. There are 7-13 eggs laid per brood, and only one brood is raised each year. The oval-shaped eggs range from tan to green-gray and are marked with brown. The female incubates the eggs for 16-21 days, and both parents feed the young chicks for 25-35 days after hatching. Young birds will stay with their parents in a family group through the fall and winter. These corvids will visit yards where suet, kitchen scraps, and peanuts are offered in tray or platform feeders that are easy for these large birds to access. Trimming grass can help encourage easier foraging, and leaving stumps or fence posts intact for perches can be attractive to these magpies. While these birds are not considered threatened, they have been persecuted in the past by farmers who considered them pests and a problem to crops. Improperly placed poisons intended for rodents can be picked up by magpies, and overuse of pesticides can also contaminate their food sources.